On Tuesday, April 2, 2019, SEPTA unveiled two historic panels on the exterior wall of Cecil B. Moore Station on the Broad Street Line that depict the life and legacy of equality warrior, Cecil Bassett Moore. The event coincided with an especially important date in the life of Mr. Moore as it would have been his 104th birthday. His storied life ranged from his time in the Montford Point Marines -- the first African-American unit of this military branch -- to his time served on Philadelphia City Council. He marched to integrate the prestigious Girard College as he believed equal education was paramount on the road to success for youth, especially African-American youth. He earned his Juris Doctorate at Temple University School of Law and was a fierce lawyer. Mr. Moore also led the local chapter of the National Association for the Advancement of Colored People. He was a champion for the underserved and underprivileged during a tumultuous time in Philadelphia and American history. He did not let fear deter him. But instead forged ahead with a sense of determination that was unmatched. When the City recognized that his legacy was important enough to change the name of Columbia Avenue to Cecil B. Moore Avenue, SEPTA followed suit in changing the name of this Broad Street Line Station to the same in 1995. 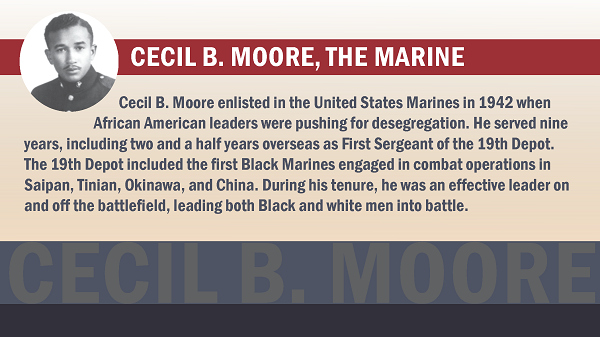 The Cecil B. Moore Freedom Fighters have been tireless advocates for keeping his legacy alive. History is only important if people take the time to learn from it, and we invite everyone – not just SEPTA customers – to come to the station to experience how one person can make an incredible difference. 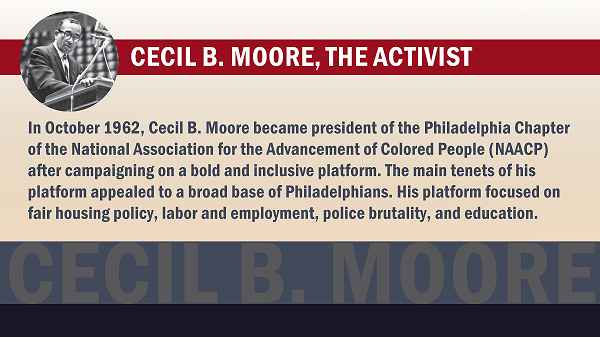 SEPTA is proud to be honoring Cecil B. Moore's legacy through this public display and we can only hope that Mr. Moore sees what we are doing in recognition of his life's work and is pleased.